The newly renovated, high-tech home for Northwestern Academy for Chicago Public Schools is a finalist for the 2017 Chicago Building Congress Merit Award. The Merit Awards recognize outstanding construction projects in the Chicago area in nine different categories. Northwestern Academy is one of four finalists in the “Interior Build-Out” division. “It is an honor to be part of something that is making a difference in the education of such bright and passionate students,” said Jan Behounek, associate principal at Holabird & Root, which was commissioned to complete the renovation. Launched in 2013 on the Evanston campus, Northwestern Academy for Chicago Public Schools is a multi-year college preparation and enrichment program for diverse, academically motivated students from Chicago Public Schools. Approximately 200 students from 40 CPS high schools are enrolled in the Academy this school year. Now located on the 16th floor of Abbott Hall, 710 Lakeshore Drive, on Northwestern’s Chicago campus in Streeterville, the rehabbed center makes the Academy’s programming and support services more easily accessible to CPS students. Each classroom is equipped with 21st century wireless and high-res technology capabilities to facilitate conference calls with prospective college and universities, as well as virtual tours of college campuses. Additionally, Academy advisers provide student participants with on-site college counseling and advising and assistance with applying for financial aid. The Academy space in Abbott – once a graduate student dorm -- went from concept to completion in just 18 months and was influenced by the teenagers themselves. As part of the college prep program, more than a dozen Academy students critiqued a variety of sample styles, colors and rooms during a “visioning” session – a planning meeting usually reserved for corporate CEO’s and a few hand-picked stakeholders. 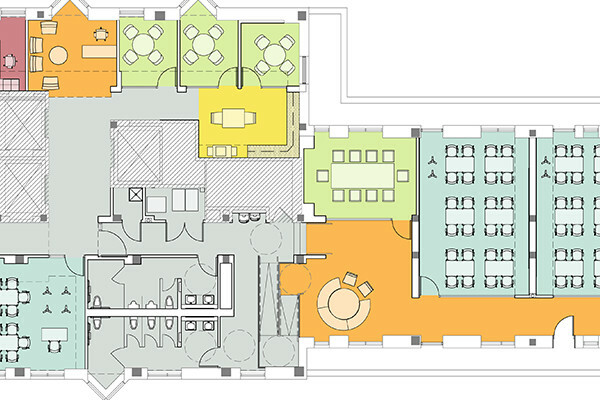 The students mulled over a wide range of styles and spaces, including corridors, classrooms and the lobby. As the drywall went up, they donned hard hats and toured the building. Involving the teenagers in the renovation process dovetailed with the program’s mission and gave the students a greater sense of ownership, said program director Cassandra Geiger. In addition to Northwestern Academy, Zurich North America, The Dearborn Restaurant, and Global Biotechnology Company are finalists for the award. Winners will be announced during the gala Merit Awards Dinner Tuesday, May 23 at the Chicago Marriott Downtown Magnificent Mile. For more information and to see past winners, visit the Chicago Building Congress website. Northwestern Academy, an extension of the Good Neighbor, Great University initiative to expand college access, is a program of Northwestern’s School of Education and Social Policy. Offered at no cost to students, the program provides students with personal enrichment, leadership development, college advising and cultural and civic engagement.